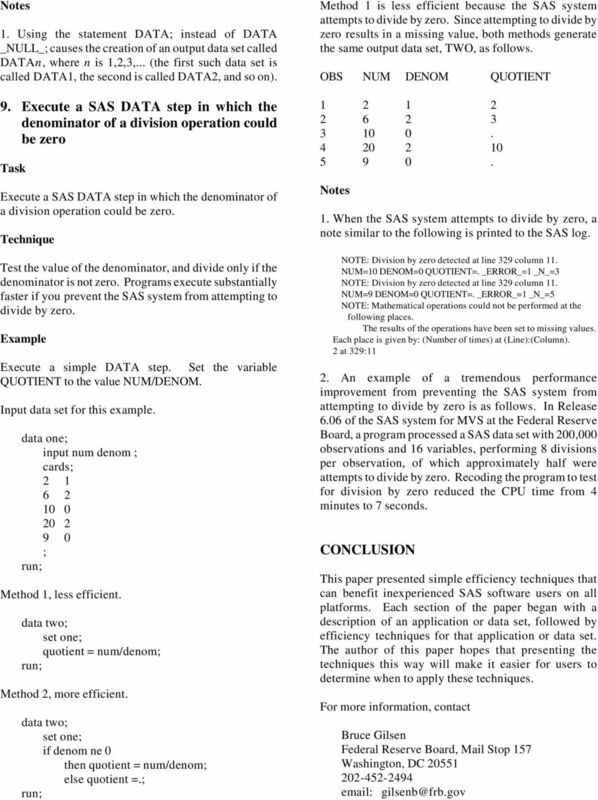 Download "SAS PROGRAM EFFICIENCY FOR BEGINNERS. Bruce Gilsen, Federal Reserve Board"
1 SAS PROGRAM EFFICIENCY FOR BEGINNERS Bruce Gilsen, Federal Reserve Board INTRODUCTION This paper presents simple efficiency techniques that can benefit inexperienced SAS software users on all platforms. Efficiency techniques are frequently documented as follows.! Describe an efficiency technique.! Demonstrate the technique with examples. The drawback to this approach is that it can be difficult for SAS software users to determine when to apply the techniques. This paper takes an alternate approach, as follows.! Describe an application or data set.! Present simple efficiency techniques for the application or data set. This approach is designed to make it easier for SAS software users to determine when to apply the techniques to their application or data set. IF, WHERE, DO WHILE, or DO UNTIL statements, use AND operators to test if all of a group of conditions are true. 5. Select observations from a SAS data set with a WHERE statement. 6. 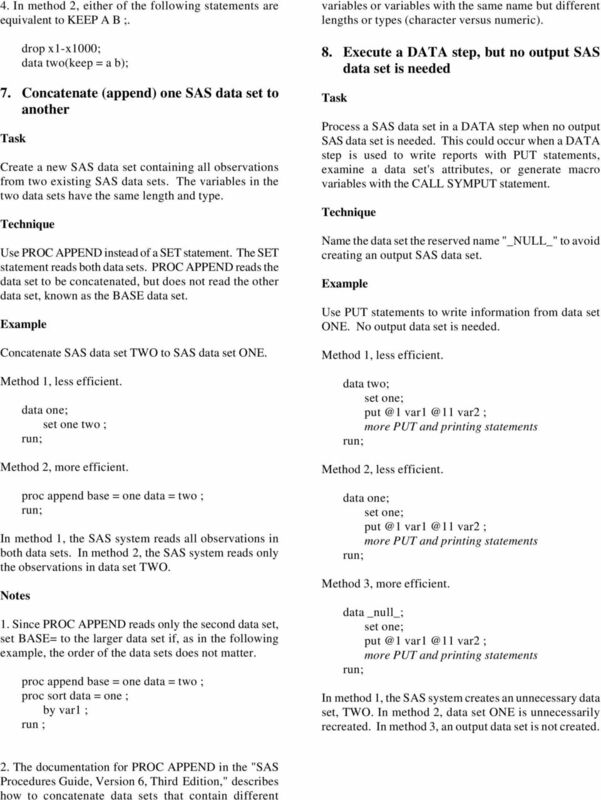 In a DATA step, read a SAS data set with many variables to create a new SAS data set. Only a few of the variables are needed in the DATA step or the new SAS data set. 7. Create a new SAS data set containing all observations from two existing SAS data sets. The variables in the two data sets have the same length and type. 8. Process a SAS data set in a DATA step when no output SAS data set is needed. This could occur when a DATA step is used to write reports with PUT statements, examine a data set's attributes, or generate macro variables with the CALL SYMPUT statement. 9. Execute a SAS DATA step in which the denominator of a division operation could be zero. SUMMARY OF PROGRAMMING TASKS This paper presents efficiency techniques for the following programming tasks. 1. Create a SAS data set by reading long records from a flat file with an INPUT statement. Keep selected records based on the values of only a few incoming variables. 2. Create a new SAS data set by reading an existing SAS data set with a SET statement. Keep selected observations based on the values of only a few incoming variables. 3. Select only some observations from a SAS data set. 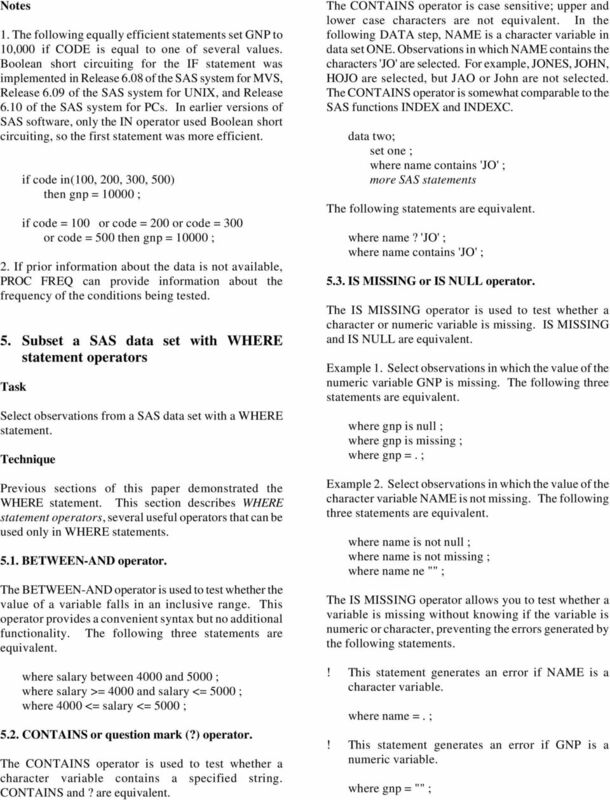 The selected data are used as input to a SAS procedure, but are not otherwise needed. 4. In IF, WHERE, DO WHILE, or DO UNTIL statements, use OR operators or an IN operator to test if at least one of a group of conditions is true. In 1. Read long records from a flat file, keeping only selected records Create a SAS data set by reading long records from a flat file with an INPUT statement. Keep selected records based on the values of only a few incoming variables. First, read only the variables needed to determine if the record should be kept. Test the values of the variables, and only read the rest of the record if necessary. Read 2000 byte records from a flat file. Keep the record (include it in the resulting SAS data set) if NETINC is greater than 100, and otherwise discard it. 2 Method 1, less efficient. data income; infile incdata; 0001 bank 0009 netinc 0017 nextvar 1993 lastvar 8.; if netinc > 100; Method 2, more efficient. data income; infile incdata; 0009 netinc if netinc > 100; 0001 bank 0017 nextvar 1993 lastvar 8.; In method 1, all 2000 bytes are read, and the current record is kept if NETINC is greater than 100. In method 2, the first INPUT statement reads only the variable NETINC. If NETINC is greater than 100, the second INPUT statement reads the rest of the current record, and the current record is kept. The at the end of the first INPUT statement ensures that the current record is available to re-read. If NETINC is not greater than 100, the current record is discarded, and only 8 bytes are read instead of The following statement is an example of a subsetting IF statement. if netinc > 100; Subsetting IF statements test a condition. If the condition is true, the SAS system continues to process the current observation. Otherwise, the SAS system discards the observation and begins processing the next observation. Subsetting IF statements can be distinguished from IF-THEN/ELSE statements because they do not contain a THEN clause. The following statements are equivalent. if netinc > 100; if not (netinc > 100) then delete; if netinc <= 100 then delete; 2. If all 2000 bytes have the same informat, then the following code is equivalent to method 2. Moving the informat to the end of the second INPUT statement makes the code easier to read. data income; infile incdata; 0009 netinc if netinc > 100; 0001 bank 0017 (nextvar. lastvar) (8.) ; 2. Subset a SAS data set to create a new SAS data set Create a new SAS data set by reading an existing SAS data set with a SET statement. Keep selected observations based on the values of only a few incoming variables. Use a WHERE statement instead of a subsetting IF statement. A WHERE statement and a subsetting IF statement both test a condition to determine if the SAS system should process an observation. They differ as follows.! 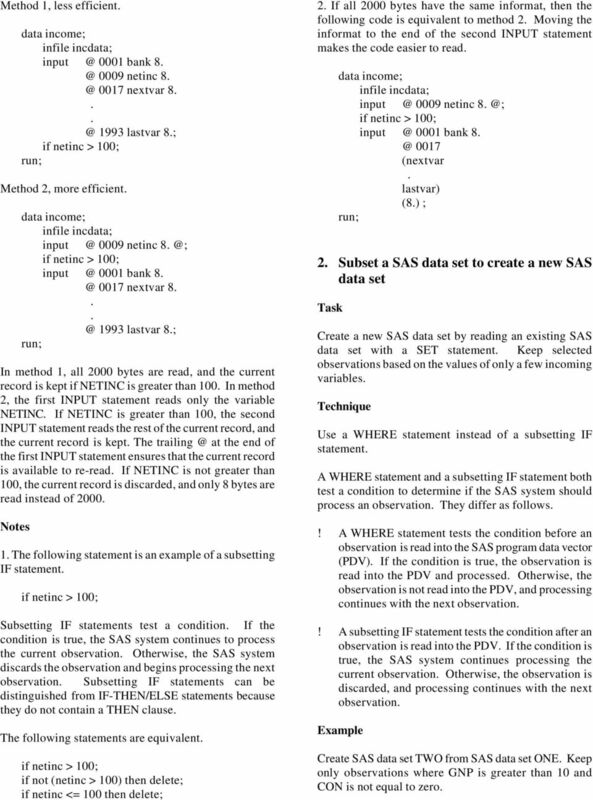 A WHERE statement tests the condition before an observation is read into the SAS program data vector (PDV). If the condition is true, the observation is read into the PDV and processed. Otherwise, the observation is not read into the PDV, and processing continues with the next observation.! A subsetting IF statement tests the condition after an observation is read into the PDV. If the condition is true, the SAS system continues processing the current observation. Otherwise, the observation is discarded, and processing continues with the next observation. Create SAS data set TWO from SAS data set ONE. Keep only observations where GNP is greater than 10 and CON is not equal to zero. 3 Method 1, less efficient. if gnp > 10 and con ne 0 ; Method 2, more efficient. where gnp > 10 and con ne 0 ; In method 1, all observations are read, and observations not meeting the selection criteria are discarded. In method 2, the WHERE statement ensures that observations not meeting the selection criteria are not read. 1. In Release 6.06 of the SAS system for MVS, WHERE statements performed less efficiently than a subsetting IF statement in a few cases. In subsequent releases, WHERE statements can perform less efficiently if they include SAS functions and in a few other cases. 2. Because WHERE statements process data before they are read into the PDV, they cannot include variables that are not part of the incoming data set, such as the following.! Variables you create in the current DATA step.! Variables automatically created by the SAS system in the DATA step, such as FIRST. variables, LAST. variables, and _N_. If data set ONE does not include the variable TAX, the following DATA step generates an error. tax = income / 2 ; where tax > 5 ; To prevent this error, use a subsetting IF statement instead of a WHERE statement, as follows. if tax > 5 ; 3. Prior to Release 6.07 of the SAS system for MVS, Release 6.07 of the SAS system for UNIX, and Release 6.07 of the SAS system for PCs, WHERE statements could not contain SAS functions. 4. To improve efficiency for large data sets, experienced users can combine WHERE statements with indexes. 3. 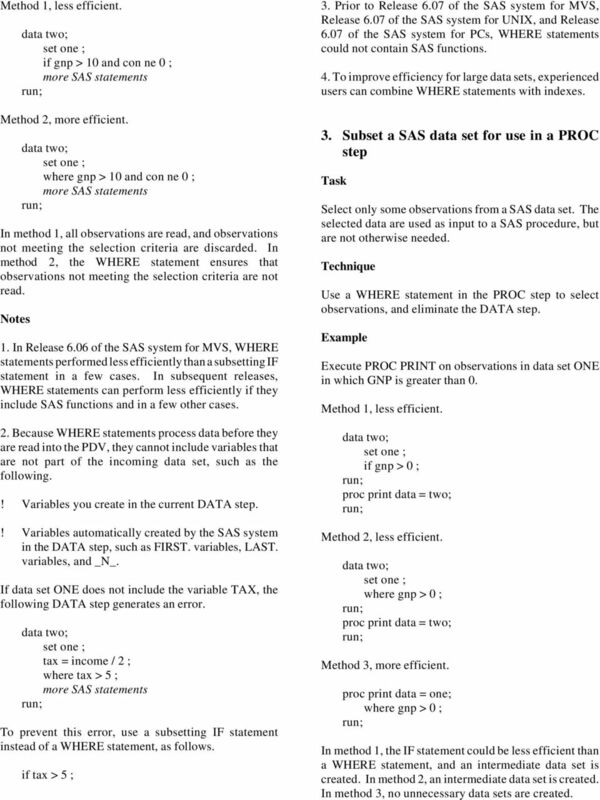 Subset a SAS data set for use in a PROC step Select only some observations from a SAS data set. The selected data are used as input to a SAS procedure, but are not otherwise needed. Use a WHERE statement in the PROC step to select observations, and eliminate the DATA step. Execute PROC PRINT on observations in data set ONE in which GNP is greater than 0. Method 1, less efficient. if gnp > 0 ; proc print data = two; Method 2, less efficient. where gnp > 0 ; proc print data = two; Method 3, more efficient. proc print data = one; where gnp > 0 ; In method 1, the IF statement could be less efficient than a WHERE statement, and an intermediate data set is created. In method 2, an intermediate data set is created. In method 3, no unnecessary data sets are created. 6 A numeric variable whose value is a special missing value (a-z or an underscore) is recognized as missing by the IS MISSING operator LIKE operator. The LIKE operator is used to test whether a character variable contains a specified pattern. A pattern consists of any combination of valid characters and the following wild card characters.! The percent sign (%) represents any number of characters (0 or more).! The underscore (_) represents any single character. The LIKE operator provides some of the functionality of the UNIX command grep. It is much more powerful than the SAS functions INDEX or INDEXC, which must be used multiple times to search for complex character patterns. The LIKE operator is case sensitive; upper and lower case characters are not equivalent. 1. Select observations in which the variable NAME begins with the character 'J', is followed by 0 or more characters, and ends with the character 'n'. John, Jan, Jn, and Johanson are selected, but Jonas, JAN, and AJohn are not selected. where name like 'J%n' ; 2. 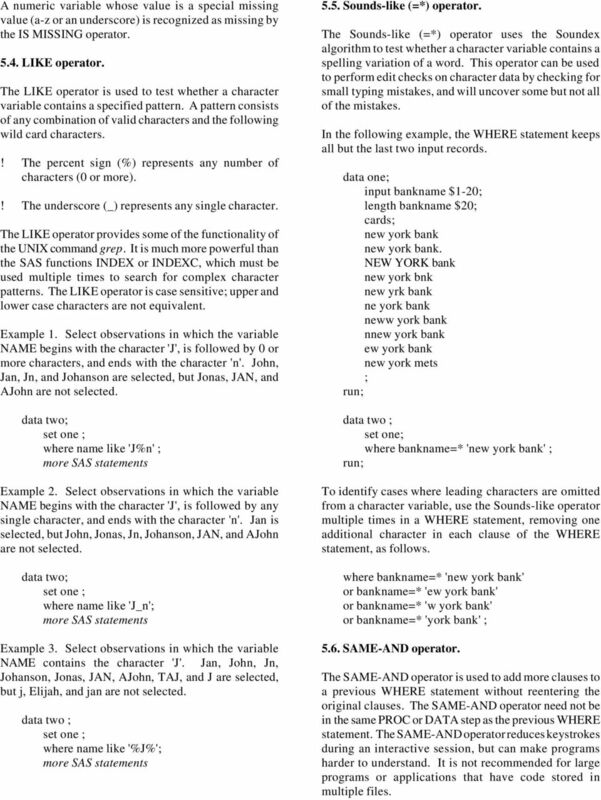 Select observations in which the variable NAME begins with the character 'J', is followed by any single character, and ends with the character 'n'. Jan is selected, but John, Jonas, Jn, Johanson, JAN, and AJohn are not selected. where name like 'J_n'; 3. Select observations in which the variable NAME contains the character 'J'. Jan, John, Jn, Johanson, Jonas, JAN, AJohn, TAJ, and J are selected, but j, Elijah, and jan are not selected. where name like '%J%'; 5.5. Sounds-like (=*) operator. The Sounds-like (=*) operator uses the Soundex algorithm to test whether a character variable contains a spelling variation of a word. This operator can be used to perform edit checks on character data by checking for small typing mistakes, and will uncover some but not all of the mistakes. In the following example, the WHERE statement keeps all but the last two input records. data one; input bankname $1-20; length bankname $20; cards; new york bank new york bank. NEW YORK bank new york bnk new yrk bank ne york bank neww york bank nnew york bank ew york bank new york mets ; where bankname=* 'new york bank' ; To identify cases where leading characters are omitted from a character variable, use the Sounds-like operator multiple times in a WHERE statement, removing one additional character in each clause of the WHERE statement, as follows. where bankname=* 'new york bank' or bankname=* 'ew york bank' or bankname=* 'w york bank' or bankname=* 'york bank' ; 5.6. SAME-AND operator. The SAME-AND operator is used to add more clauses to a previous WHERE statement without reentering the original clauses. The SAME-AND operator need not be in the same PROC or DATA step as the previous WHERE statement. The SAME-AND operator reduces keystrokes during an interactive session, but can make programs harder to understand. It is not recommended for large programs or applications that have code stored in multiple files. 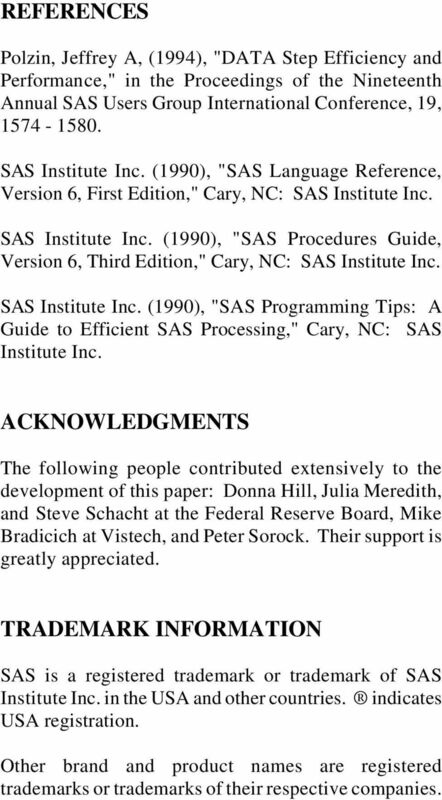 10 REFERENCES Polzin, Jeffrey A, (1994), "DATA Step Efficiency and Performance," in the Proceedings of the Nineteenth Annual SAS Users Group International Conference, 19, SAS Institute Inc. (1990), "SAS Language Reference, Version 6, First Edition," Cary, NC: SAS Institute Inc. SAS Institute Inc. (1990), "SAS Procedures Guide, Version 6, Third Edition," Cary, NC: SAS Institute Inc. SAS Institute Inc. (1990), "SAS Programming Tips: A Guide to Efficient SAS Processing," Cary, NC: SAS Institute Inc. ACKNOWLEDGMENTS The following people contributed extensively to the development of this paper: Donna Hill, Julia Meredith, and Steve Schacht at the Federal Reserve Board, Mike Bradicich at Vistech, and Peter Sorock. Their support is greatly appreciated. TRADEMARK INFORMATION SAS is a registered trademark or trademark of SAS Institute Inc. in the USA and other countries. indicates USA registration. Other brand and product names are registered trademarks or trademarks of their respective companies. The SET Statement and Beyond: Uses and Abuses of the SET Statement S. David Riba, JADE Tech, Inc., Clearwater, FL ABSTRACT The SET statement is one of the most frequently used statements in the SAS System. SAS-INTERVIEW QUESTIONS 1. What SAS statements would you code to read an external raw data file to a DATA step? Ans: Infile and Input statements are used to read external raw data file to a Data Step. Programming Tricks For Reducing Storage And Work Space Curtis A. Smith, Defense Contract Audit Agency, La Mirada, CA. From The Little SAS Book, Fifth Edition. Full book available for purchase here. Integrity Constraints and Audit Trails Working Together Gary Franklin, SAS Institute Inc., Austin, TX Art Jensen, SAS Institute Inc.
Magic Tutorial #S-1: The scheme command-line interpreter Rajit Manohar Department of Computer Science California Institute of Technology Pasadena, CA 91125 This tutorial corresponds to Magic version 7. Restricting and Sorting Data. Copyright 2006, Oracle. All rights reserved. Beyond SQL Essentials: The Need for Speed When Accessing SAS Data Transcript Beyond SQL Essentials: The Need for Speed When Accessing SAS Data Transcript was developed by Mark Jordan and Linda Mitterling. %DIFF: A SAS Macro to Compare Documents in Word or ASCII Format. 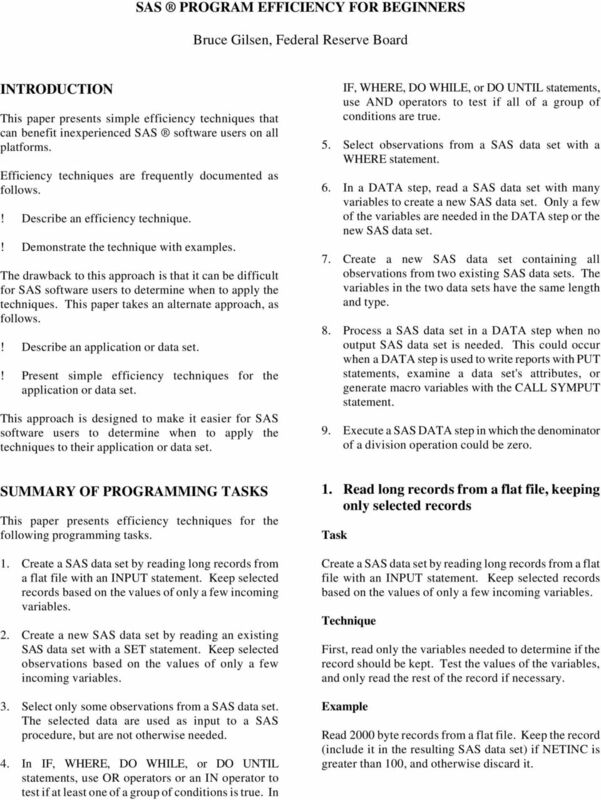 Michelle Xu and Jay Zhou Amylin Pharmaceuticals, Inc.
Paper 55-28 Describing and Retrieving Data with SAS formats David Johnson, DKV-J Consultancies, Holmeswood, England ABSTRACT For many business users, the format procedure might be their favourite SAS procedure. Choosing the Best Method to Create an Excel Report Romain Miralles, Clinovo, Sunnyvale, CA ABSTRACT PROC EXPORT, LIBNAME, DDE or excelxp tagset? Many techniques exist to create an excel file using SAS.